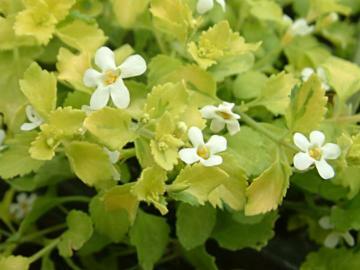 Compact, trailing habit with good variegated foliage of green and gold leaves. Small five-petalled white flowers. Moist soil in shade. Frost tender, needs protection to over-winter in cool areas. Often treated as an annual. Cut-back by about two-thirds to encourage re-blooming. Containers, hanging baskets, bedding. Good for brightening shady areas.